The Wagh Bakri Tea Group, India's 3rd largest packaged Tea Company has launched its 3rd Tea Lounge in Mumbai at Juhu – Tara Road. 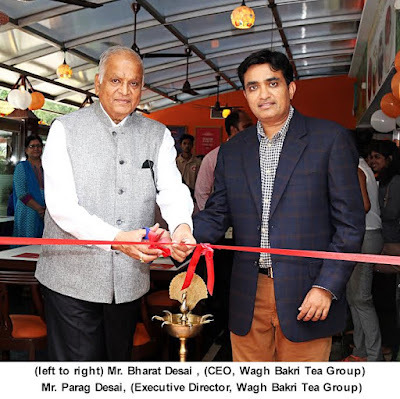 Wagh Bakri is also operating 4 tea lounges in Delhi & one signature lounge in Ahmedabad. This Wagh Bakri Tea Lounge that spreads across 750 sq. ft. will offer tea enthusiasts a variety of over 45 types of handpicked teas across the globe & mouthwatering Indian & continental 100% vegetarian snacks. A perfect place to unwind and indulge in tea time conversations and more, the Wagh Bakri Tea Lounge in Mumbai will serve over 45 varieties of tea, which include varieties of Wagh Bakri Masala tea, Kashmiri Kahwa, lemon & mint ice tea, pure Darjeeling tea, English breakfast tea bags, tea with ice cream, Jasmine in Green tea, lemon + cinnamon tea and many more. Apart from the teas, the other big attraction for consumers is the array of mouthwatering Indian snacks with like almond cookies, chocolate crispy cookie, blueberry muffin, veg calzone. Besides the teas available at the newly launched Lounge, the complete range of Wagh Bakri packaged tea will also be available for purchase. With a wide range of teas and snacks to choose from there is something for everyone at the Wagh Bakri Tea lounge. Wagh Bakri Tea Group is a Premium Tea Company with a long-lasting relationship of love and trust with its loyal consumers since 1892.With Leaf from the best tea gardens selected and personally tasted by group directors, today, Wagh Bakri Tea is the 3rd largest packaged tea company in India with a turnover of over Rs. 1000 Cr. and over 45 million Kgs of tea distribution. The group is a leading stride in tea exports and retail consumer all over the world. With huge number of Wagh Bakri tea lovers around the world, it has emerged as a truly global brand. The company enjoys undisputed market presence in Gujarat, Rajasthan, Madhya Pradesh, Maharashtra, Delhi & Hyderabad and has recently forayed in to Chhattisgarh and Goa.